Bedecked with french-braided pigtails (what I do with my hair when it’s wet), it was off to the LITA Program Planning Committee Meeting. 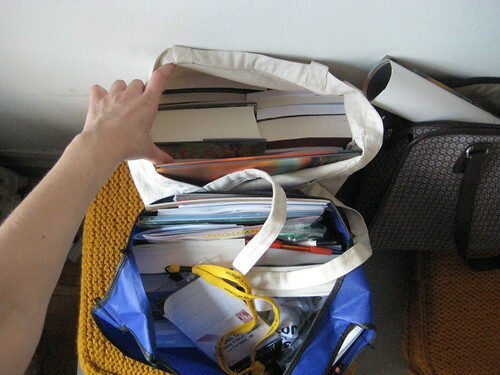 I felt undressed, being one of a few in the room without my laptop, but as I was headed to the exhibits, I hadn’t been able to justify the weight of bringing it along. I did have to turn off notifications on my phone temporarily–Griffey was tweeting from the other end of the table and it kept setting my phone off. Oops. We had a good, productive, short meeting about timelines, deadlines, and ideas for programs. The initial program suggestion form had already gone out, now we had to discuss timelines to get things done. Though I knew deadlines were awfully early, my head was spinning to realize they really thought we’d have all programs submitted by the end of this year’s conference. I’m still planning things for fall programming at my library, let alone programs for an annual conference NEXT year. Back to the conference center, because the Incredibly-Patient-Mother was coming up for an exhibit day! Yippee!! This was an afternoon planned to simply stroll amongst the vendors, partake of food type offerings, grab a couple Advanced Readers Copies of fall books, identify things that I wanted to order, and make trouble. Yes, I’m a problematic little hedgehog. I had very strong words for Overdrive, most of them not very polite. I still need to sit down and write a full out letter to the president of Overdrive, because the “oh, we’ve never heard anything like that before” and lame excuses for your “front line promotional team” told with wide eyes just doesn’t cut it. Other librarians have told me of similar problems, don’t lie to me. The audiobook vendors were gently put off again, no, I don’t use standing orders, yes, feel free to email me things. I don’t do face to face meetings with vendors outside of conferences and I don’t like phone calls either. Send me an email, if I have questions, I’ll get back to you. I got a few Advanced Reader Copies. 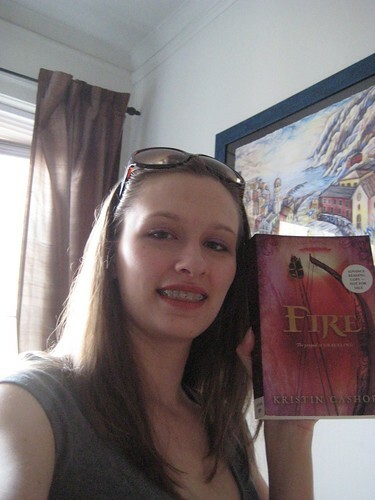 I had no hopes of weaseling my way into another copy of Catching Fire, but I did get a copy of Kristin Cashore’s newest “Fire”. If you haven’t read my Graceling review, see link. I haven’t gotten to it yet, but it’s high on the “read now” pile. I was pretty impressed with most of the vendors. They engaged me in conversation, not immediately my mother. I wondered, as I can pass for well under my normal age in pigtails, if I’d be written off as one of the teens running around the conference. I grabbed some catalogs, ate a few cookies, got some insight on new foreign language stuff coming from Recorded Books (actually kinda interested in that), and met Carman Agra Deedy. I know her from her beautiful cockroach story and The Library Dragon, done so well and with such beautiful illustrations. She had a new book with her, 14 Cows for America. It’s a post-9/11 story and between the beautiful words and the artwork, I was a mess by the time I finished reading it. Deedy graciously gave the teary-eyed me a copy and signed it for me–along with some posters that I’m going inflict upon my office mates because they are cool!!! The Incredibly-Patient-Mother and I lasted until the vendors closed at five and then she drove me home, taking pity on her daughter who would have otherwise had to carry four bags of stuff back on Blue Line Shuttle Buses (Blue Line was still down). The exhibits were the last task for me. I spun from there out into the summer sun of Chicago, ready for a street fair, fun and adventure. And with my brain overflowing….